Yesterday’s workout was a KILLER. 4 min Rounds with 1 min rest in between rounds. Do all three rounds twice through. I’m surprisingly not sore today. Which is a miracle. I thought my legs were going to fall off on that thruster/row combo. I blame my awesome muscle recovery entirely on this dish. Butternut and sage are basically MFEO (“made for each other” for those who don’t get the Sleepless in Seattle reference). Add to that some healthy fat and protein from the eggs and you are all set for your post-workout nutritional needs! In an oven-safe skillet, add some coconut oil and sauté onion over medium low heat until slightly caramelized. This will take 5-10 mins. The flame shouldn’t be hot enough to let them burn. Stir occasionally. Add sage and stir till fragrant. In a large bowl, whisk salt, pepper, and eggs. 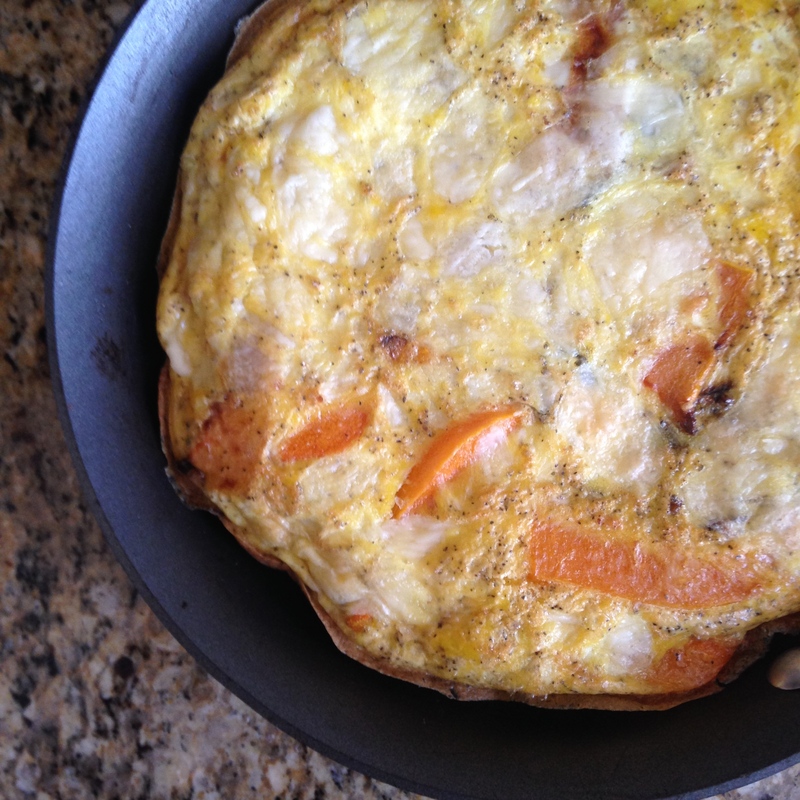 Carefully drop in butternut squash and evenly distribute throughout the skillet. Place skillet in oven and bake until the center is set. About 10 mins.